On December 20, 1860, South Carolina made the fateful decision to secede from the United States—a response to Abraham Lincoln’s election to the presidency the month before. Following South Carolina’s lead, the rest of the lower South states seceded in quick succession. In February 1861 these rebel states formed the Confederate States of America, and tensions with the Union finally exploded in April with the bombardment of Fort Sumter in South Carolina’s Charleston Harbor. Civil War had begun. But the volatile political climate leading up to secession and the war permeated Princeton’s campus as well as the halls of government—especially considering the college’s large proportion of Southerners in its student body. Secession created divisions at intimate as well as local and national levels, simultaneously testing the bonds of friendship, college communities, and nationhood. You know that the clause reprobating slavery was stricken from the Declaration of Independence – this was [insisted] to by the South which wished to continue the importation of slaves and by the North which wished to make money carrying them…One word more and you will admit Democracy [the Democratic Party] is Right. Democratic presidents for forty-eight-years, opposition only sixteen. For Cannon and like-minded Princetonians, the nation’s history of supporting slavery and the longevity of the Democratic Party put anti-slavery Republicans out-of-step with American tradition. Stand up for Southern rights – never vote for a black – or any other kind of Republican – Fight the infernal rascals to the end – And if we have peace in the Union – we’ll give them…the biggest turn they ever got. Although you [McGowan] live in a [abolitionist] Country, still I hope that your life will be passed pleasantly…But all frivolity laid aside I hope dear Mac that your pathway may ever lie in the sunshine of prosperity. 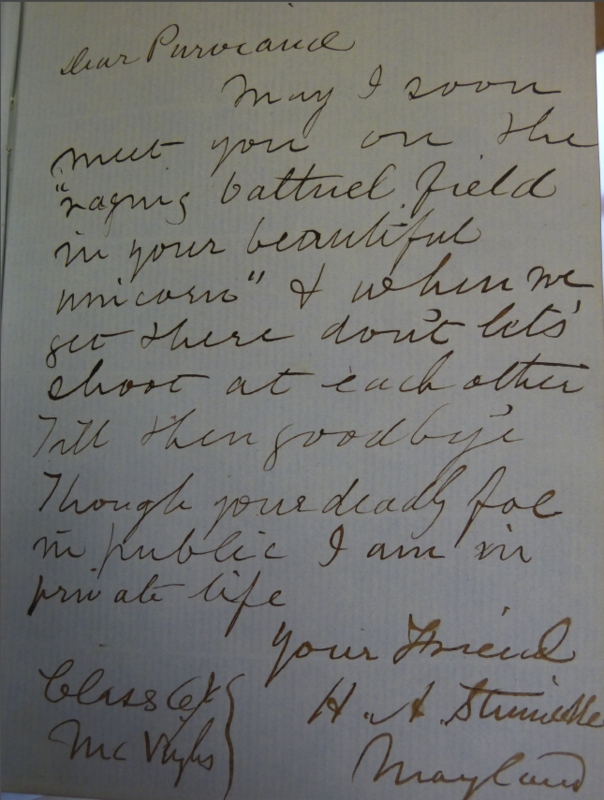 Autograph book entry by Edward F. Neufville ('1862) to Thomson McGowan ('1861). I have given up in despair any hopes of ever convincing you of the ‘divine i	institution’ of slavery, but shall ever retain the most pleasant recollection of my antagonist…Remember me as your friend & classmate, David R. Frazer. May I soon meet you on the ‘raging [battlefield]…’ & when we get there don’t let’s shoot at each other Till then goodbye Though your deadly foe in public I am in private life Your Friend. Autograph book entry from Samuel Comfort to Winfield Purviance ('1861). Autograph book entry from Henry Stinnecke to Winfield Purviance ('1861). That board’s statement proved prescient. The following April, when seven Deep South states had seceded and armed hostilities erupted at Fort Sumter, fifty-six students left Princeton “in consequence of the state of the country.” The vast majority of these students hailed from slaveholding states. Two months later, the trustees explained that almost twenty more had departed the college, bringing the total to seventy-four. Out of a class of almost 300 (the number of students enrolled at the beginning of the term), roughly a fourth of the student population withdrew from the school—an astonishing change in the composition and nature of Princeton’s campus. The absence of a quarter of students, mostly Southerners “with very few exceptions” according to the Trustees, was caused by “the disturbed state” and “present condition of the country. Those students who came from the Southern States, have nearly all gone home.” Though Tennessee native Charlie Coffin stayed at the college well after secession, by 1864 even he acknowledged that “the die [had] at last been cast…It is no longer practicable for Southern Students to stay in Princeton, and I must leave…”Long the institutional haven for Southern-born students, Princeton was suddenly deprived of the student population that had supported and shaped its history. A list of southern students excused from school due to the outbreak of the Civil War. We must at any rate give our mite of energy to assist in protecting our homes…As friends we have boarded together; as friends we have walked together; as friends we have studied together; as friends we will leave college together; as friends we will battle together and, if necessary, as friends we will die together. William W. Whittington Jr. (‘1861) lamented the onset of armed conflict and the necessity of leaving Princeton, but nonetheless accepted the responsibility of fighting for his home state of Louisiana. “I was in hopes that we would be able to graduate together,” he wrote to McClure, “but I am sadly [mistaken]. War has commenced and all of the Southern students are leaving for their homes and I expect soon to go also. I am sorry we are compelled to leave, but it is right for every man from the South to be at home.” Leaving college allowed McClure to fulfill that duty, and he eventually served as a captain in the Confederate Army’s Commissary Department. Recent research into Princeton’s Civil War veterans indicates that more than 600 alumni served in the Civil War—with more than half of them fighting for the Confederacy. From the class of 1861 alone, at least eight former Princeton students died as a result of their military service during the Civil War. Other Princeton men contributed to the Confederate cause by helping to draft their respective states’ secession ordinances, or serving in the new Confederate government. Alumni James Chesnut (whose wife Mary Boykin Chesnut wrote a famous diary of her wartime experiences), Ephraim Seabrook, John Townsend, and John Manning all signed South Carolina’s ordinance of December 20, 1860. Mississippian Henry Chambers (class of 1844) was instrumental in stopping Confederate plans to recruit black men as soldiers. Alexander Boteler (class of 1835) has been credited with designing the CSA’s flag and seal. And Jehu A. Orr of Mississippi (class of 1849, non-graduate) had been the last surviving member of the Confederate Congress before his death in 1921. Perhaps more than any other elite Northern institution, Princeton alumni were deeply entangled in the Confederacy’s politics and leadership. Bryan LaPointe is a history PhD student at Princeton. He focuses on American political and social history of the 19th century, as well as slavery, antislavery, and emancipation during the Civil War and Reconstruction Eras in the U.S. and the larger Atlantic world. Before coming to Princeton, he earned a BA in history with high honors (along with a French minor) from the University of Michigan. Sean Wilentz, The Rise of American Democracy: Jefferson to Lincoln (New York: W.W. Norton, 2005), 768-88. E. Hudson Worrall to Sylvester Woodbridge III (1859); Autograph Book Collection (A040), Box 17; Princeton University Archives, Department of Rare Books and Special Collections, Princeton University Library. Ambrose Young to William S. Combs (1861); Autograph Book Collection (A040), Box 19. “Popy Cosh” was a variation of the English phrase “poppycock,” or silliness. 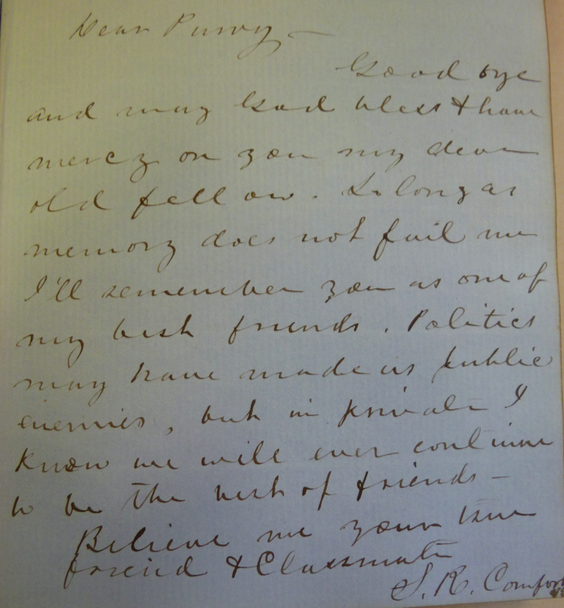 James W. Cannon to Winfield S. Purviance (1861); Autograph Book Collection (A040), Box 20. James. A.M. Campbell to Winfield S. Purviance (1861); Autograph Book Collection (A040), Box 20. S. Thompson Corn to Walter Scott Brown (1860); Autograph Book Collection (A040), Box 17. J. L. Witerow to Walter Scott Brown (1860); Autograph Book Collection (A040), Box 17. Benjamin Dashiell to William B. Lane (1861); Autograph Book Collection (A040), Box 19. Thomas Powell Langley to William J.P. Morrison (1861); Autograph Book Collection (A040), Box 20. 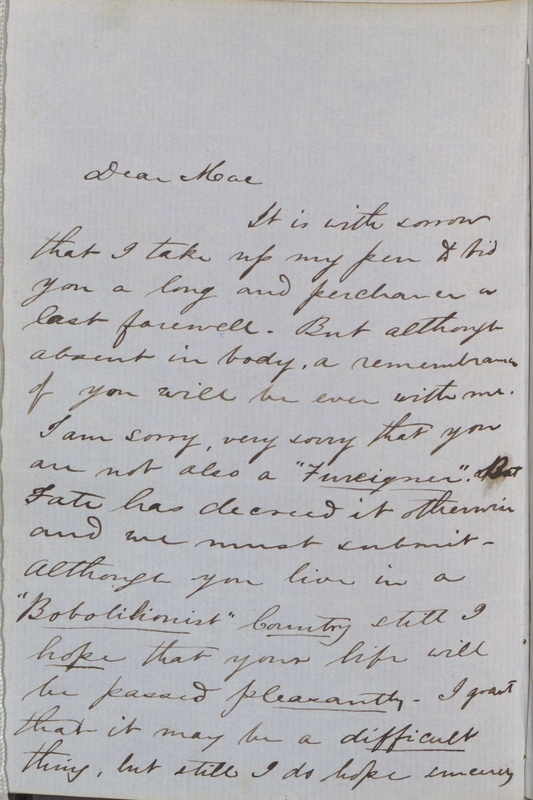 Thomson McGowan to Edward Wilde (1861); Autograph Book Collection (A040), Box 21. Edward F. Neufville to Thomson McGowan (1861); Autograph Book Collection (A040), Box 20. David R. Frazer to Edward Wilde (1861); Autograph Book Collection (A040), Box 21. Frank Butler to Winfield S. Purviance (1861); Autograph Book Collection (A040), Box 20. Samuel R. Comfort to Winfield S. Purviance (1861); Autograph Book Collection (A040), Box 20. Henry A. Stinnecke to Winfield S. Purviance (1861); Autograph Book Collection (A040), Box 20. Board of Trustee Minutes of the College of New Jersey, vol. 4, 175. Complete Minutes of Faculty Meetings, 1855-1861; Princeton University Archives, Department of Rare Books and Special Collections, Princeton University Library, vol. 6, 401-02. Board of Trustee Minutes, vol. 4, 190. Charles Coffin to Thomas Maston (1864); Autograph Book Collection (A040), Box 23. Complete Minutes of Faculty Meetings, vol. 6, 406-09. 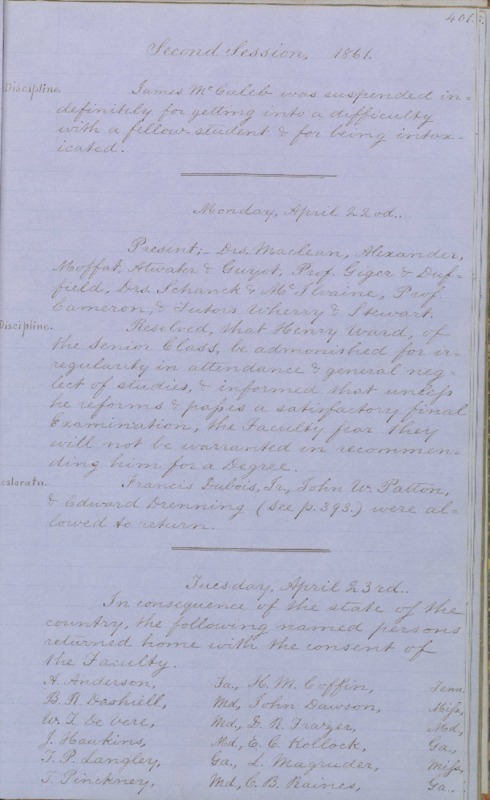 According to the Faculty Minutes of April 23, 1861, 22 of the 56 students who left campus were seniors. Even though they were listed as not having “passed their Final Examination at the Regular time,” all of them went on to complete their degrees and graduate as part of the class of 1861. As quoted in Jeanne Barkley, ed., Autographs: A selection of writings from friends to Ewing Graham McClure (Washington College Academy, TN: Pioneer Printers, 1980), 7. W. Barksdale Maynard, “Princeton in the Confederacy’s Service,” Princeton Alumni Weekly, accessed March 16, 2017, https://paw.princeton.edu/article/princeton-confederacys-service; Lesa Redmond, “South Carolina and Secession,” Princeton and Slavery Project (Princeton University, 2016).